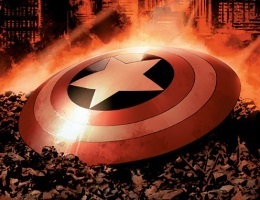 Captain America takes up his shield often as his primary weapon, a concave disk 2.5 feet in diameter, weighing 12 pounds. It is reportedly made of a unique Vibranium-metal alloy that has never been duplicated. It is virtually indestructible and is as much an offensive weapon as a defensive one. The shield of faith is virtually indestructible as well. It is made up of a unique alloy that incorporates prayer, scripture, worship and study. Prayer praises the Lord for the gifts and blessings you enjoy, and lifts up concerns you are facing. Scripture ensures that prayer is grounded in the Word of God. Worship acknowledges the glimpses of God’s glory granted through the day such as the sunrise, a child’s hug, a kiss from your wife, a key meeting, a deal gone good and sufferings that you may be working through. Study of the Bible strengthens the foundational relationship with Jesus the Christ, the “Word became flesh” – John 1:14. Those martyred and those who endured great suffering while working to translate the Bible into English are to be honored by a commitment to read and study the Word of God. Take up the shield of faith to discern evil in the various guises he takes on – busy-ness, wrong priorities, lust, covetousness, selfishness, etc… As you discern, the shield of faith will extinguish the flaming arrows of the evil one. Practice spiritual disciplines – routinely pray, read scripture, worship and study. Be sensitive to the Holy Spirit and His nudging to alert you to arrows incoming. Share this new or renewed commitment with a battle buddy or small group of battle buddies and meet regularly to pray together and discuss progress. A faithful father takes up the shield of faith to protect his family and keep evil at bay.